MONTREAL—The Montreal Impact almost pulled off the unthinkable—winning CONCACAF Champions League by beating arguably the region’s greatest team, Club América of Mexico. But in the end, América ran out a 4–2 winner on the night (5–3 in aggregate) and left no doubt as to which club is king of the CONCACAF region. With a crowd of 61,004—the largest crowd to watch a soccer game in Canada—behind the Impact as their 12th man, Montreal played with supreme confidence. And it showed on their opening goal. “It was incredible for us. I had goosebumps. Seriously it was second to none,” said Impact coach Frank Klopas in his postmatch press conference. But the Mexicans showed what makes them so good. They settled things down, dominated possession, and turned on the style to bring the Impact back down to Earth. It makes you better as a team. Montreal got it started with a weaving run from Ignacio Piatti through the América defense to set up Andres Romero who created just enough room to send a cheeky finish past the Mexican defenders and into the goal. Olympic Stadium erupted like it probably never has before. And it was as if a higher power was watching over the Impact when América’s Dario Benedetto’s tap in from close range hit the underside of the crossbar, but didn’t bounce across the goal line. But Benedetto scored a goal worthy of a Champions League final to level the match for América and cue the second half comeback. He ended the night with a hat trick. The goal gave América the reward they truly deserved. They then sealed the deal with two goals in two minutes shortly after the hour mark and the crowd went quiet realizing their hopes of CONCACAF glory were dashed. Substitute striker Jack McInerney got the Impact a consolation goal but it was too little, too late. Had Montreal pulled off the colossal upset, it would have given them a chance to face the likes of a Real Madrid, Barcelona, or Bayern Munich—in meaningful competition at the FIFA Club World Cup. Nevertheless, the run by the Montreal Impact brings back memories of Canada’s 2000 Gold Cup triumph and Greece’s unlikely Euro 2004 win. It could have been one of those truly rare stories that come about once a generation. “We should be proud of what we did as a team,” said Klopas. “I’m extremely proud of our guys.” Klopas brought his whole coaching staff to the press conference to congratulate them for their hard work and putting together a strong team in short order. 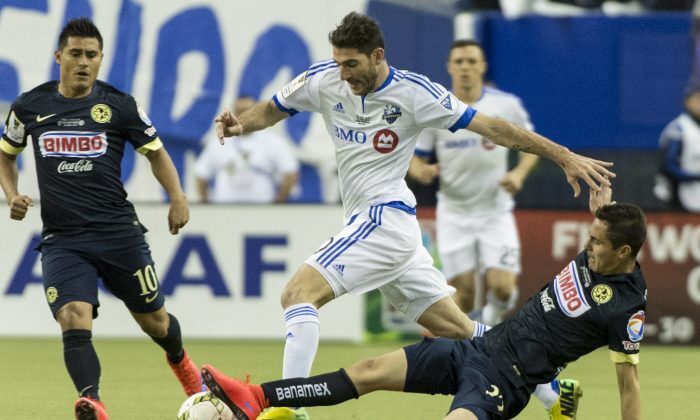 The Impact’s journey began with a 2–1 loss to lower-division FC Edmonton on May 7, 2014. But the Impact won a hard-fought second leg 4–2 and moved on to fact Toronto FC. The Impact beat TFC 2–1 on aggregate goals and reached the Champions League group stage. The Impact began with two victories over minnows CD FAS of El Salvador before taking down the group favourite New York Red Bulls 1–0 last September in Montreal. That was a key result that helped Montreal win its group and enter the knockout stage. The Impact put themselves in great position to win the Champions League with a stunning 1–1 draw at Azteca Stadium in Mexico City on April 22. The away goals rule has been their biggest friend. Montreal got past Mexico’s Pachuca in the quarterfinals and Costa Rica’s Alajuelense in the semifinals by virtue of scoring more goals on the road than their opposition. To make matters more difficult for the Impact, first-choice goalkeeper Evan Bush was suspended from Wednesday’s game due to a yellow card received at the end of the first leg on April 22. The Impact started up a bit of a storm with potential loan-ins of goalkeepers from other MLS clubs. In the end, the Impact went with German keeper Kristian Nicht who was signed on Monday. And just a week after the Impact’s CCL exertions end, the 2015 Canadian Championship gets underway against Toronto FC. Montreal, of course, won the 2014 Canadian Championship, which kicked off their Cinderella run in CCL. And injured striker Cameron Porter, whose goal against Pachuca put the Impact in the semifinals summed it up best. “Injuries happen yellow cards happen and I think it’s just a testament to the depth of this team that despite the people going down and despite these injuries, and these setbacks, we were able to field a team throughout the tournament that’s been very successful,” Porter said. Toronto FC made the biggest offseason splash, but are facing a familiar tale, while the Montreal Impact and Vancouver Whitecaps have had a terrific March.